Life Fitness does not only work on cardio equipment! 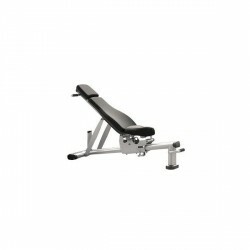 Just the opposite, the adjustable bench of strength training is a sturdy weight bench, made of most precious materials. Offering a 6 times adjustable rest, a twice adjustable seat, and a good upholstery, most different strength exercises can be done with a very good comfort. 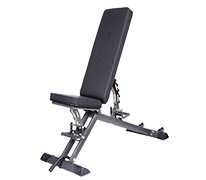 The Life Fitness weight training devices convince by high quality workmanship, extreme longevity, and best adjustment possibilities - that is also true for the Life Fitness Adjustable Bench! solid weight bench of well-known Life Fitness quality ! transport rollers and handle bar offer an easy storage !